The mood at PERC is somber this morning due to the news of the loss of an extraordinary woman. Elinor Ostrom was the first woman to receive the Nobel Prize in Economics. Ostrom received the 2009 Nobel Prize in Economic Sciences for her groundbreaking research demonstrating that ordinary people are capable of creating rules and institutions that allow for the sustainable and equitable management of shared resources. She shared the prize with Oliver Williamson, a University of California economist. 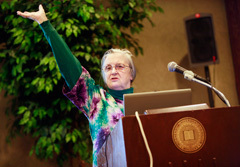 The recipient of numerous international awards and honorary degrees, Ostrom was selected in April as one of the Time 100 for 2012, Time magazine’s annual list of the world’s 100 most influential people. In May, the IU Board of Trustees renamed the Workshop in Political Theory and Policy Analysis to honor Elinor Ostrom and her husband and colleague, Vincent Ostrom, who founded the center in 1973. Ostrom’s work on Governing The Commons certainly influenced PERC early on. Donald Leal, for example, wrote Community-Run Fisheries: Preventing the Tragedy of the Commons in 1996. Leal highlights her groundbreaking research focusing on the factors that induce a community of users to cooperate and defend their rights to steward a resource. No doubt her contributions will continue to shed light on free market environmentalism. “Calling on Communities” is a chapter inspired by Ostrom’s research and will appear in the forthcoming edition of Free Market Environmentalism. She is survived by her husband and by an international extended family of colleagues, collaborators, staff and friends who worked closely with her during an extraordinary 50-year career. Read more here.